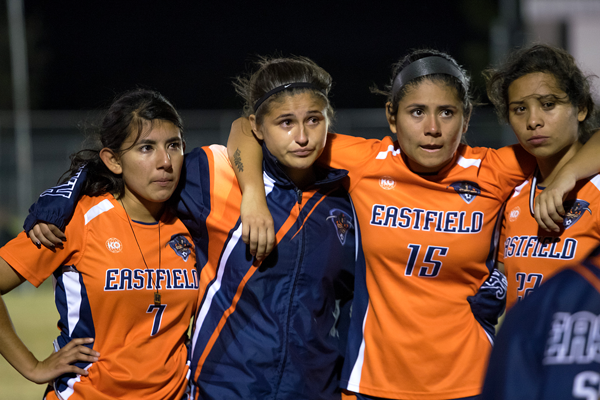 RICHLAND COLLEGE— The 1-0 loss to Richland in the National Junior College Athletic Association Region V tournament semifinal took a moment to sink in for the Eastfield soccer team. As the final whistle signified the end of the game — and their season — the players trudged off the field, looking exhausted and distraught while others broke into tears. After falling behind to an early strike by Richland’s Jessica Dowse, the team was unable to score an equalizer in the physical matchup. The players created chances in both halves but couldn’t break through to score. In the previous round of the tournament, the Harvesters came from behind to top the North Lake Blazers 2-1. The Harvesters have yet to win the conference tournament and make it to nationals. Last year, they lost to Brookhaven in a penalty shootout in the semifinals. In 2015, the team made it to the championship match after going undefeated in conference but lost to Richland 4-3. Eastfield (18-4-1) ended their season with a record number of wins but finished third in conference on 8-2-1. They scored 75 goals in 23 games, the highest tally in school history. Freshman forward Arianna Dunsworth broke the single-season and all-time scoring record after netting 24 goals. Sophomore midfielder Emily Juarez broke the all-time school record with her 10 assists this season and 11 last year. Freshman goalkeeper Gabriela Roa, who started every game this season, recorded 10 shutouts and made 94 saves, with a .839 save percentage, equaling Eastfield’s best defensive record from 2015. Defenders Aileen Hernandez, Adriana Arzola, Naomi Rivera, midfielder Juarez, and forwards Viviana Aguayo and Yesmin Gabino have all played their last game for the Harvesters. With 32 wins over two seasons, they became the class with the most wins in the program’s history. After the loss, Stein said he understands how the veteran players on the team felt. Stein said coaching a junior college makes it difficult to move on because around half the roster is lost every year, but he knows the squad will reload nonetheless. Juarez said she wants the team to learn from the season-ending loss. Arzola struggled to find words to describe her disappointment after the game but said these past two years were the best of her life. Stein said the season felt like a roller coaster and said this is one of the most fun groups he’s coached.